My husband and I had been looking for an officiant kind of last minute. I stumbled upon Catherine online and ran with it. Not thinking that it mattered much about who we had marry us, I can't say I put too much thought into it. When we met with this lovely vibrant soul, I expected some stuffy and boring individual who would treat this strictly as a paying job, do the bare minimum and call it a day. I was so very wrong about all of the above. When we had the chance to meet Cat, I realized how limitless her energy was, and I found her sarcastic and witty nature to be not only relatable, but straight up awesome. She would be an absolute asset to our wedding, and I can now confidently say that she was. Look, if you're going into your wedding thinking that the officiant role can be done by anyone, you're sadly mistaken. Catherine doesn't treat this like a paying gig, but rather, an honour. My husband and I both were super happy with the wonderful job she did, and best of all, she catered her role to US and OUR story, not some generic one told a thousand times before. You will want her energy and spirit to make your ceremony all the more special, and you will have guests approaching you afterwards telling you what a great job she did. Take it from me, a happy bride and now wife who unknowingly hit it out of the park by choosing this woman. Plus, she's a red head, and they're always pretty rad. Originally my partner and I had planned on a no fuss civil ceremony in NYC but as luck would have it the timing just wasn't right and when I realised Canada would work I sent off a few emails and Catherine responded immediately. Everything fell into place within days and then on the day when we wanted to stand in the midst of the mist of Niagara Falls Catherine just smiled and said sure thing! It was amazing! We had a perfect rainbow behind us, thundering water beyond us and even though we had just met Catherine, she was so genuine and warm not even the drenching mist could dampen our spirits. We cannot thank Catherine enough for her efforts in making our special day exactly that - incredibly special. I honestly felt like we were all old friends she was just so personable and a great soul. Thanks too for our wonderful witnesses who made us feel welcome and not strangers. Truly beautiful people have the incredible ability to make others feel their warmth and compassion, Catherine Skinner you truly are one of these people, thank you so much. I can't say enough good things about Catherine! She was a pleasure to meet from the start- very vibrant, warm and professional. I was a nervous wreck during the ceremony but she kept me centered with her calmness and humor. She's a pleasure to work with and we are so glad we found her! Catherine Skinner was easy going, helpful and friendly. As soon as we met her we felt 100% confident that she would make our day perfect. Thank you Catherine, we could not have chosen a better officiant! Catherine Skinner was simply incredible. The ceremony was beautiful and her presence and energy really made it so very special. We could not of had a better officiant and indeed would not have wanted anyone else. Catherine Skinner was so personable and warm and it felt like we knew her for a long time already. She was awesome and made us feel so comfortable we would recommend her for sure!!! 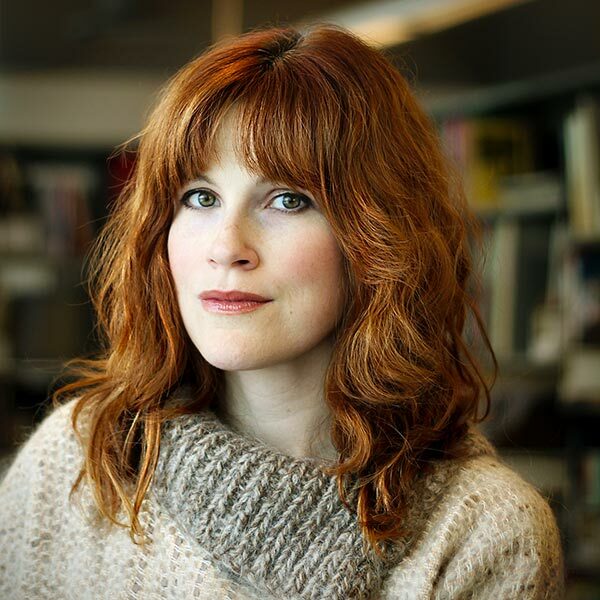 Catherine Skinner exceeded our expectations to be honest. She was friendly and humorous, exactly what we needed! 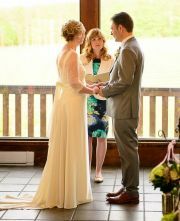 Choosing our officiant was one of the easiest and rewarding decisions we had to make during out entire process. Catherine was amazing!! We couldn't have asked for a more magical wedding day, she made everything run so flawless and easy. Thanks for everything Catherine! Catherine was wonderful! She made everything run smoothly and was super accommodating! Catherine Skinner was so personable and warm and we felt like we knew her for a long time already. Catherine was awesome and made us feel so comfortable. We would recommend her for sure!!! Catherine Skinner was exactly what we were looking for in our officiant. She is very personable and had a great sense of humour. From beginning to end this was a great experience. We will definitely recommend your services to our friends. Catherine Skinner far exceeded our expectations for our wedding officiant. 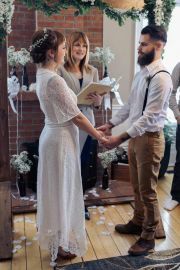 Not only was she very accommodating of our requests for our ceremony, but her warm demeanor calmed our nerves leading up to, and during, the ceremony. We instantly felt her great energy the first time we met, and we couldn't have made a better choice to trust our ceremony with anyone else. We received many great comments about Catherine after our ceremony, and we gladly referred her to everyone we talked to during the reception, and we will continue to do so. Catherine's wonderful warm nature showed right through. She was patient and understanding of the forces beyond our control. We got married on an awful, stormy day which caused delays and she did not rush us. We definitely recommend her 110%! The moment I met her I went up to her and gave her a hug, realizing we had only spoken on the phone and I may have seems overly friendly. But that's the feeling I had with her. That she was friendly and I felt comfortable. I am very picky with who I want apart of my wedding and I have to like them and feel comfortable. Catherine Skinner was amazing every step of the way and I recommend to her everyone, she was just so wonderful!